It would have been enough for Aaron Rodgers to emerge from the tunnel for the second half just to keep playing. 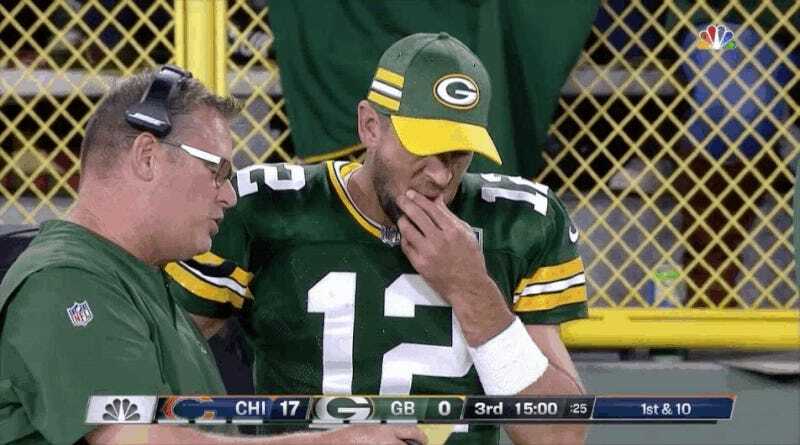 He had left the game on a cart after injuring his left knee in the first half, and it was easy to fear that Rodgers might be done for the year on the season’s first night. But there he was at the start of the third quarter, back on the field, shrugging it all off. And before long, he’d be bringing the Packers back from a 20-point deficit, even as he could barely put much weight on his left leg. Because Aaron Rodgers makes no sense. All those short, quick throws provided the perfect setup for that deep shot to Geronimo Allison. But Rodgers did his part, too, as NBC’s Cris Collinsworth noticed: He stepped up in the pocket and looked hard to his left, which drew the deep safety in that direction, toward backup cornerback Marcus Cooper and away from cornerback Kyle Fuller, who was left in single coverage on Allison. Allison had maybe a step on Fuller. 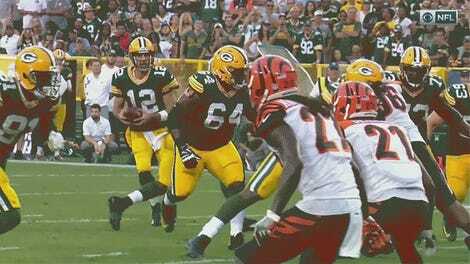 It was more than enough for Rodgers, who delivered a perfect ball off his back foot, some 50 yards through the air. 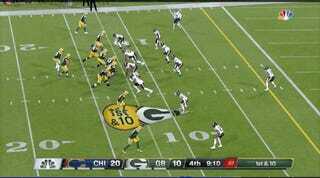 ...followed three plays later by a TD flip to Adams, which Rodgers again made off his back foot as the pocket began to collapse. 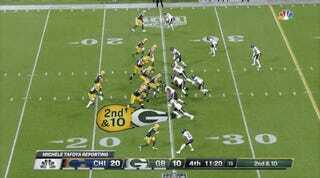 The Bears used more than six minutes to march 71 yards. But once they had to settle for a field goal to make the score 23-17, it felt inevitable that Rodgers would find a way to win it. He had 2:39 and 75 yards to go. After incompletions to Adams and Allison, Rodgers took his time to find Randall Cobb over the middle for what seemed like enough for a first down. Instead, Cobb found enough room to run for the game-winner. Rodgers has had too many description-defying moments in his 14-year career, from all the perfect throws he made to win Super Bowl 45 to all the backyard slinging he did to bury the Cowboys in a playoff game two years ago. Last night, on a knee that may yet turn out to be pretty messed up, he somehow might have had his best performance yet.